Those of you who looked carefully, or even not very carefully, probably noticed something unusual: the desk is at two different heights. That’s because I’ve been using a GeekDesk for long enough to form an opinion on it, which is that I’d be reluctant to go back to a regular desk or a purely standing desk. I’ll write a longer review when I have more time, but the preceding sentence tells you most of what you need to know. 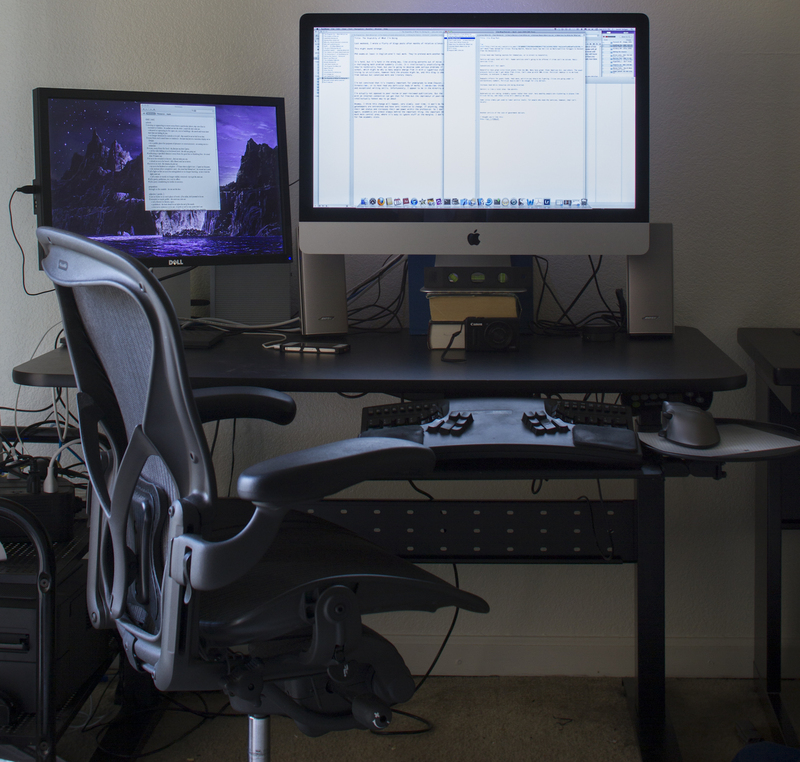 The other salient upgrade is from a 24″ iMac to a 27″ iMac with an SSD and a conventional hard drive. This machine inspired me to write “Mac OS 10.7 is out today, and I don’t care because ‘In the Beginning was the Command Line,’” because computers have now, finally, become “fast enough” and “good enough for my purposes. It’s taken a long time! I keep meaning to get a better stand than a pair of books, but that’s the sort of project that’s very easy to delay, indefinitely, until tomorrow. The keyboard remains the same, and it’s hard to see what could make me replace the Kinesis Advantage. Its keys still feel new. The speakers aren’t very interesting, although they are external and thus better than the built-in ones, but they’re probably wasted on me because I don’t listen to music all that often, and they’re overkill for movies or TV shows. The external monitor is a 23” Dell with an IPS display, although I can’t remember the model number and don’t feel like looking it up. It’s a fine panel, but not very interesting. The lights on the back of the iMac are cheap Antec Halo LED lights, which are supposed to reduce eyestrain in dark rooms. Not sure if they actually do. I suspect turning down the iMac from “blinding” to “tolerate” would have as strong an effect. You can see a Canon s100, which usually rides in my pocket. Sony now makes a better version of the s100—the RX100—but the RX100 is also $300 more. In a couple of shots there’s also a boring iPhone. If I weren’t on a family plan, I’d probably get a cheap Android phone, because I use maybe 5% of its features. Unless you’re doing a LOT of sexting, I don’t think I see the point in getting a more expensive “smart” phone over a less expensive one. 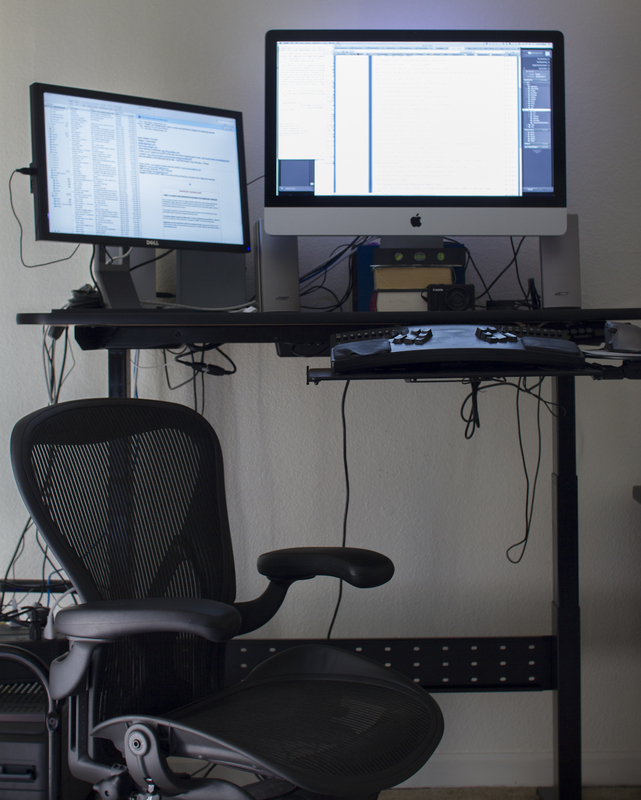 There’s also an Aeron, which is better for me than their recent Embody. Reasons for why I say that will follow when I have more time. 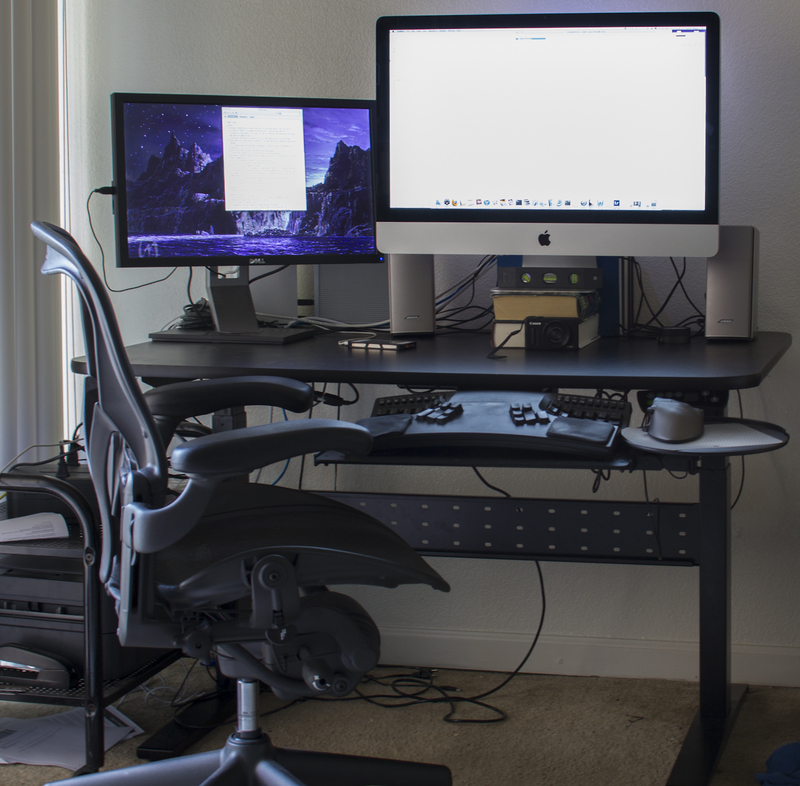 What do you think overall of the Geekdesk? I’ve heard some good things about it, but it seems a little bit “clunky” to me, or cluttered I guess. 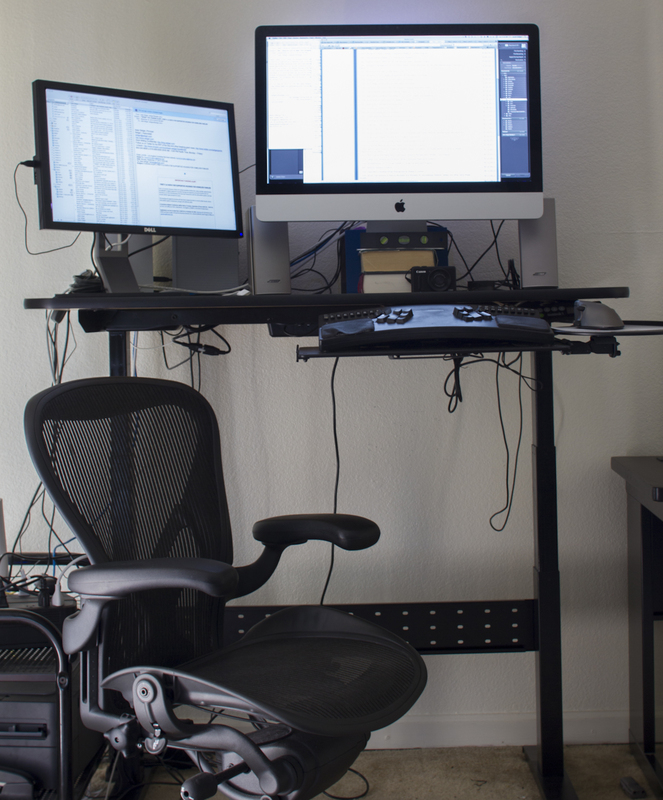 I’ve been looking at the NextDesk Solo lately– it just came out and is smaller than the GeekDesk and the other NextDesk models, but I’m looking to put something small in my small house. It’s eco-friendly, it’s adjustable, it has an adjustable keyboard tray, and it’s less expensive than some of the other adjustable height desks I’ve been looking at. And thanks for the post.